Walking on cement floors can be really hard on your back and feet, but a good pair of shoes can save you a lot of pain. RV shows are by nature very large, so you will be need to be able to comfortably cover a lot of space. Good shoes, comfortable clothing (you don’t want to be too bundled up from the cold outside) and arriving on a full(ish) stomach can help your comfort. No one likes to think about budget when they are doing something as fun as planning their vacations, but it is important to arrive knowing what you can afford to spend. This also helps you to narrow down where to focus at the show, which will reduce overwhelm and your aching feet. This doesn’t mean you can’t check out the luxury models of your dreams or go significantly under budget in favour of simplicity. But if you start at the highest end models that you cannot afford or don’t want, the simpler models will seem…less. And they really aren’t. Knowing your budget will also mean you can take advantage of any special pricing that is offered at the show only, because you will know exactly what you can afford. 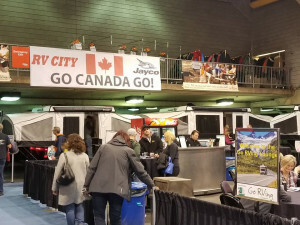 For this reason, you might also consider looking into financing before you come to an RV show – being able to make decisions when opportunity arises is the best way to get a great deal. Not every RV fits every consumer. Knowing how you will be using the RV will help you pick a suitable one. Do you already have a pickup truck for towing, or is a motorhome a better fit? Do you know the tow-rating of your truck? How many people will be coming camping? Are you planning on taking long trips or short ones? What are your storage, seating and sleeping needs? Will you be camping in the mountains or on the beach? If you don’t know what you will be using the RV for, it will be harder for you and the RV experts that help you to know which RV is your perfect match. If you are planning on traveling as a family, they have a stake in which one you choose. Sure, kids might be more interested in things like TVs than on price, but they will be spending a lot of time in your new home-away-from-home. You want to make sure it suits their needs as well. Don’t be afraid to talk to exhibitors. People are often afraid to talk to exhibitors because they think they will be “sold to”. But the truth is, the exhibitors are just as interested in helping you find the best model for you, and answering your questions. Feel free to do your own independent research, but don’t dismiss the expertise available to you at these shows. Don’t be afraid to talk to other RVers. RV shows have a wealth of RV experience for you to learn from, beyond even the exhibitors. Other RVers are a great resource. Ask questions, like what their favourite campground is, or even better, what piece of advice they have that they wish they had known before they started RVing. Almost everyone has some interesting insight that you can’t get just anywhere. Even if you don’t make a friend, the amount you will learn will be well worth a conversation. Keep in mind that exhibitors are typically RV enthusiasts on their downtime as well, so make sure you ask them for their tips as well!